On Thursday, I got a wild hare and decided that I really, really wanted to come back to Seattle for a visit. I haven't been "home" in 3 months practically and the promise of warm weather, great friends and good running, simply called to me through the SF cold, gray summer. I snapped up one of the last seats on a Saturday flight home (forgetting it was Seafair, as I pondered how things were so booked) and was back in Seattle in no time. It is refreshing to be home. I was excited to see my mom and very happy that my bestest everest friend Jonathan is on vacation AND doing his peak training for CCC100, which starts the same day as TR ends (and sadly I miss out on pacing him!). As soon as I booked my ticket, Jonathan and I made plans to run on Sunday morning. We decided that we would do the last 32 miles of the CCC100 course if we could coordinate cars with Linda who was joining a larger group of CCC-ers who were doing the same portion of the course. Jonathan had headed out on part of the same portion of the course with the boys on Saturday and Linda had done another section of the course with the same group she would be with for Sunday. Thankfully, the plan worked and at 6:45am Jonathan was scooping me up for the long drive out to Kachess Lake. 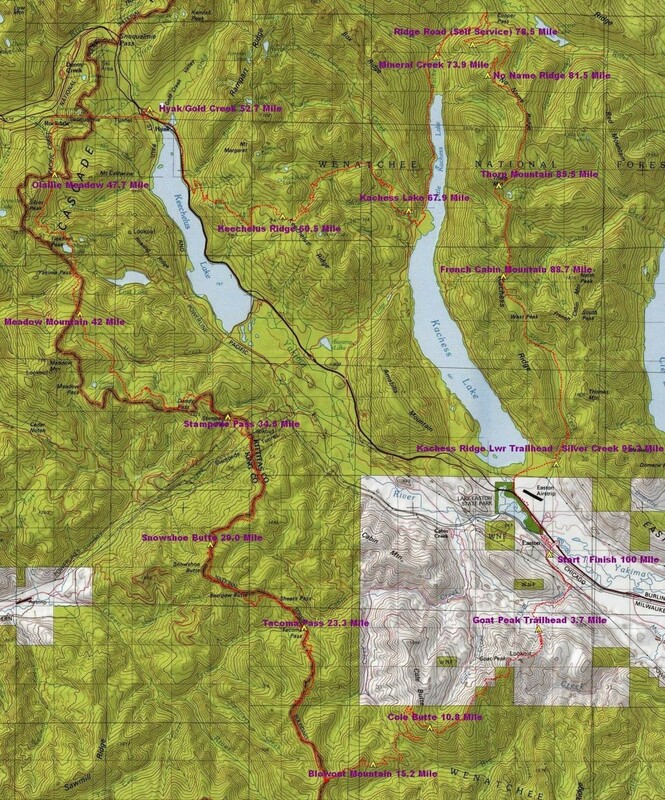 Cascade Crest 100 course map, we ran from Kachess Lake to end. Cascade Crest is definitely no joke. It has 20+k of gain and at least 7,000 of that is in the section we were going to run. I paced last year and did a good deal of this section at night, including the Trail from Hell which is where we started. We arrived and were ready to go outfitted with a hydration pack each and two handhelds each, since this section of the course was pretty remote. Jonathan had gotten some water purfication tablets so that we could drink out of the few streams along the course. And by few, I mean few. We were a few hours in before we hit water once and had to be especially careful about rationing the water. When we got out of the car, the larger group which had organized together was coming into the parking area where we were going to start from. They had run in from outside the parks gates. There were about 7-8 including friends Linda, Jamie, Eric, Steve, Shawna, Joe, Arthur and a few I am less familiar with but know I know (you know what I mean), there was also a larger group of early starters who we would pass along the trail at various times. Jonathan and I had planned that we would run together and do our own thing. It was fun to chat with the group as we started out on the Trail from Hell. The Trail from Hell is very technical and there are lots of very steep cliffs that would certainly equal demise if you slipped and fell off (which I tried to do at least once). Jonathan hung back to talk with Linda (my twin) to discuss her plan for the day and any contingencies. Meanwhile, I chatted it up with Eric and Steve. We were being snap happy when Jonathan caught up to us and we took off on our own pace. I am kind of a spaz and it didn't help that I wore old road shoes for this run since my Salomon Whispers were dead, dead, dead and I didn't have the chance to get my package of shoes from my team (Salomon Racing Team!) before I left. These trails are definitely better done with some traction. I slipped numerous times, cracked my head on a tree branch (that apparently owen had hit the day before) and nearly fell off a cliff because of the head bonk. By the time we got off the Trail from Hell. I was scrapped, scratched and broken in. At least this time, if felt alot shorter. It is a fun trail that borders the edge of Kachess Lake and is super pretty. Jonathan and I used the opportunity to catch up on life and times and tell all sorts of funny stories. We were to Mineral Creek in "no time", thinking we had just arrived there behind Joe and Shawna as I had seen them just off down the trail ahead of us. However, as we got out on the gravel road, we realized that they had missed the turn to Mineral Creek and got mis-directed, as Jonathan and the boys had done the day before. We contemplated turning around to retrieve them, but the trail they were on dead ends and the turn they missed was actually pretty well marked with ribbons from the organizer of the larger group. It was getting quite warm and I was sipping judiciously on my water and taking my Saltstick caps. It was a lot hotter than I have been training in, but I was also concerned about running out since we did not know when we would actually find water. That is a scary thing. We ran and walked up the road for a while, then stopped for a snack. I ate one of my delicious peanut butter protein bars by Macrobar and we were quickly underway. Jonathan had told me that at any time if I wanted to run the hill, I could just take off and wait for him at the top. My calves were pretty tight after already running 93 miles that week before we started including a 27 road run on Thursday and a 23 hilly hammerfest on Friday. I hadn't decided to take off but after our short stop, I decided that I should challenge myself and just freaking get going and up to the top. I headed off and powered my way all the way up. I felt really good. When I got to the top, I waited (but not for very long) for Jonathan and then we headed towards the infamous "Needles". Jonathan commented that my running form on the hills had significantly improved and that I was running with a great deal of efficiency. It was nice to hear, since I rarely get any outside indicator of how my form is. Jonathan and I had talked on the way up about what I spoke about in my last blog post. We talked about the Here and Now and how ultimately cultivating your future is "as simple" as being fully present here and now. Being fully present means being a participant in your own life, not passively being pushed along or anything else. In that moment, as we ran up that ridge I was able to really feel like I was coming around a corner that leads further and further away from that place of crisis, so oft occupied. It is something that is ongoing, but there is something about being high up in the mountains on the top of the world, doing what you love that makes you feel like you are on top of the world (har har) and can conquer/do/be anything. Life is beautiful and for the most part simple when we let it be. I am learning, always learning which is part of the fun too. Heading up to No Name Ridge, 3 miles of up after 5 miles of "Hell". Where we finally found water and lots of bugs. Thank goodness for water purification tablets. We anticipated that the whole run would take us between 6-7 hours with stops (because the clock doesn't stop in a race when you do that is for sure!) and before we were even to Thorpe Mtn (though over a few of the needles) we were in dire need for some water. Thankfully we happened upon a little stream and filled up. It makes it a bit less scary to know that you have full bottles! We were running well through the Needles, which are really just a series of intensely steep climbs, followed by narrow single track usually along a intense drop off on the side of a ridge! And did I mention, with very little tree cover. It was awesome. My calves got a bit tight going up some of the steeper climbs when I was getting low on water, but I actually felt strong enough to bound up and over some super steep places where I never before would have been able to dream of running. It was great. High atop the Cascades. Heading up to Thorpe Mtn. Jonathan at the ranger station on Thorpe Mtn. We made it to the top in good time and made the final push up to the Ranger Station/Fire Look out on the top of the mountain. Some of the early starters were refueling up there and we stopped for a chat and mentally prepared ourselves for a bit of down, then two more ups (the last two needles) and then the long,long, long "7 miles" of downhill. I remember from pacing last year that that 7 miles of downhill felt more like 20 and was a very intense stretch. Plus, you pound the crap out of your legs. Finally over the last needle. Yeah! Jonathan and I are very happy. Jonathan is the best training partner, ever. At least for me. We tend to race at similar times and thus are usually doing peak training at the same time. Jonathan and I have been running together since my first trail night run last year in May. Over that time, we have learned how to push, motivate and support one another. We always have fun and it was such a great decision to come back this weekend. We made it down to French Cabin, which means you are done with the Needles and just have on climb over a pass before hitting the 7 miles of downhill. Jonathan has been struggling with a foot injury that for the most part had not bothered him on our run. Downhill is a bigger irritant to his foot than anything, so we just decided to see how we felt on the down. It was funny because after hammering a few miles of the downhill, we stopped and said, wow we are really getting into race mode (aka pounding the crap out of ourselves) and we had a quick snack. We got more water from a stream, which made us both feel much better and I went both feet into the icy cool stream as well as hat and head. It felt great, but moments later when we started to run again my wet road shoes met tree branch and I slipped and fell hard on my face. Fun. It felt like forever getting down to Silver Creek but in a way no time at all either. We had been running for a good portion of the day under the beating hot sun and yet, I felt I could keep on going. Sure my legs were tired, but I was so blissed out, I didn't want it to end. From Silver Creek to the cafe where the group had parked their cars is somewhat anticlimactic. You go from sweet single track in the mountains to running on a MTB dirt path under some powerlines before turning on to a road that parallels I-5. Sure you have to get to the start/finish somehow, but it still is a bit of a downer. Granted, it also motivates you to haul tail since you have no interest in lingering. Somewhere closing in on the end. Nice cool shade. Photo by Jonathan. We hit the road and zoomed back into the parking lot, happy, thirsty and tired. It was a true epic. Jeff, the organizer of the larger group, had a sign in and out sheet on his car and had left bananas and watermelon for everyone to have. I dove face first into a giant piece of watermelon and it tasted absolutely divine. This run proved one thing: I am fit and I am ready. Jonathan is definitely fit and ready for CCC100 and I am bummed I won't be there to pace him (unless someone figures out a way to teleport me from the finish of TR to Hyak in the same day). I am happy to be home, though I am not doing anything special per se. I am just here and that is enough. It is nice just to be here for no other reason than that. It is now the beginning of taper time for TR. We are three weeks out and so I will be cutting back my mileage a bit. I PR'd for a training week's worth of mileage last week with 125 miles, which makes me even more impressed with how good I felt on this run since it was miles 93-125. The most I have run in 7 days is 146, which was Saturday of last week to Friday of this week. That bodes really well for my fitness at TR. Ah life, I love it!